Our Summer House is a tastefully decorated one room accommodation, ideal for a couple for a quiet getaway or two couples. It can also cater for a family consisting Mum, Dad and two children under 13. The sleeping arrangements are a loft queen bed, which stairs can be taken away if not used, double bed, and a sofa bed. There is a TV with free view and DVD player with plenty of movies to choose from. The kitchen area is fully equipped with a small two burner unless you don't want to cook outside. 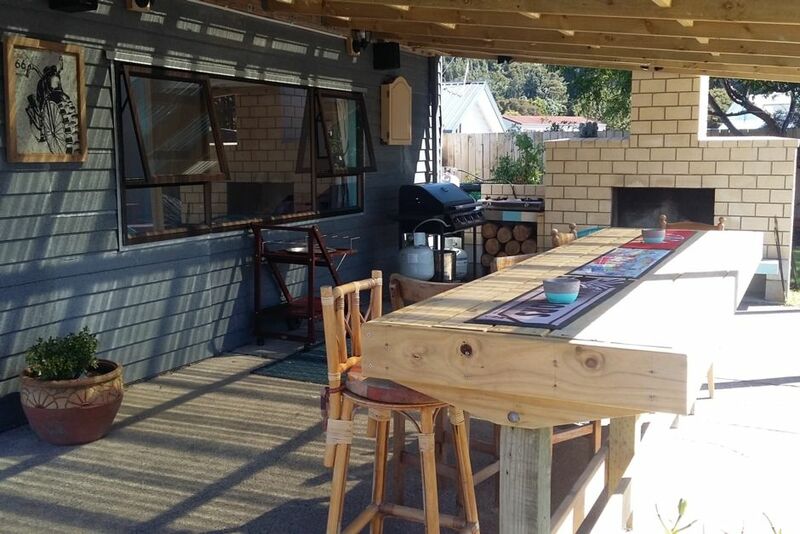 There is an outside area with a breakfast bar, outdoor fire for the colder nights and cooking facilities consisting of bbq and a seperate gas two burner. The section is fully fenced. We do not accept tents or caravans for extra quests. It is 10 minute walk to the beach and 15 minute walk to town. Enjoy the local Fishing Club, Cossie Club and also RSA. Flat walking for all ages to get around. There is plenty of activities at the beach, canoe hire, bike hire and some stunning walking tracks. Whangamata also has a picture theatre, mini golf and one 9 hole and one 18 hole golf course. Cool, funky, practical and all you need. Great little kiwi pad , has everything you need, with some cool extras outside, nice and flat and fenced for the kids to run around. We had heaps of fun thanks heaps guys. My stay in Whangamata couldn't have been better. The beautiful cosy accommodation is exactly what you see in the photos. I highly recommend coming down and experiencing it for yourself. Great for a couple, small family or just by yourself like I did. Oh, by the way the hosts Carol and Mark are the loveliest people you will meet. Thank you so much Emma, it was a pleasure having you here. We take pride in our little Bach and love people like you coming to enjoy it, and thank you so much for leaving the place exceptionally clean. The darts and fireplace were a hit! The darts and fireplace were a hit! secure section for little ones, such a well designed little place. Walkable to the dairy, community pool and beach. Great weekend get away. The kitchen was well stocked, the BBQ was great, the beds were lovely and comfy. The kitchen was well stocked, the BBQ was great, the beds were lovely and comfy. We had a wonderful time in the sleep out and loved how private it felt too. Ruby the dog was a highlight and the location was great for the beach and town. We would love to come back and stay here, we honestly had such a great time. Thanks again! Such a great spot! Amazing set up with a relaxed vibe. Such a great spot! Amazing set up with a relaxed vibe. I would definitely stay there again!